Zest the orange and place zest in a large shallow bowl. Cut the orange in half. Add the juice from one half to the zest. Slice the remaining half an orange into 1/4 inch slices; cut each slice into quarters and set aside. Add the egg, milk and vanilla to the bowl and whisk to blend. Warm the maple syrup in a small saucepan or microwave. Preheat a large nonstick skillet over medium heat. Dip two slices of bread into the egg mixture coating both sides. Let the excess egg mixture drip off bread before placing in the skillet. Cook until golden brown on both sides, about 3 to 4 minutes per side. Remove to a plate and keep warm. Repeat process with remaining bread. Quickly cut each slice of French Toast into quarters. 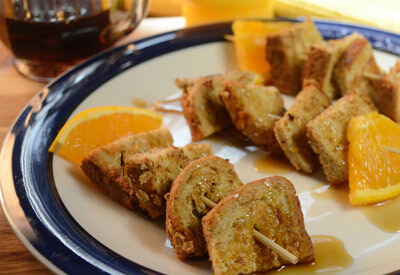 Skewer four pieces of toast onto a wooden stick and add a quarter slice of orange. Repeat with remaining pieces of toast and orange.